﻿﻿Welcome to the Our Daily Bread Designs May Release Blog Hop! If you arrived here from Dawn's Blog, you are in the right place, if not, you might want to start at the ODBD Blog, and hop from there. Be sure to leave comments along the way for your chance to win one of the THREE ODBD Gift Certificates good towards the purchase of stamps during the month of May! The Hop will run from 8am EDT May 1 through 8pm EDT May 2. The winners will be announced on the ODBD Blog on May 3. 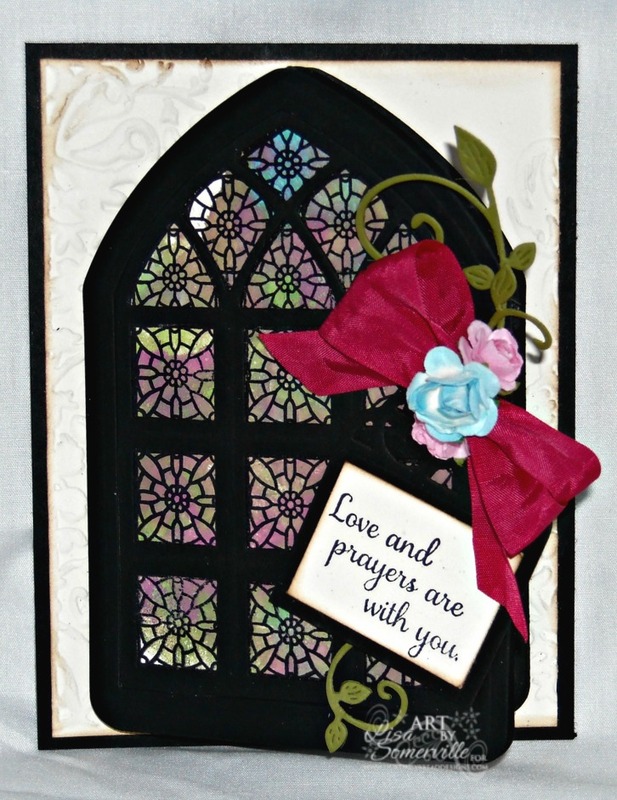 I thought the new Cathedral Window stamps and Custom Cathedral Window and Border Dies would make a beautiful Sympathy card. 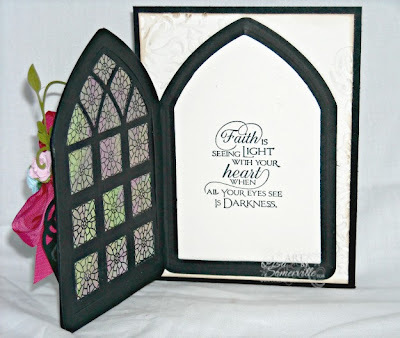 I used the Gelli Arts Plate and Distress Paints to created a background for the Cathedral Windows Wood stamp, stamping the window in Black Archival after paint had dried. Next, I folded the Black card stock in half, then die cut and embossed the panel using the Cathedral Window and Border Die. Then, I placed both the Window and Offset panels together, holding them in place with a piece of EZ Release Tape, and die cut and embossed the Window, this also left me with a small trim piece to use as an edge around the window. I added a Black tag using the tag from the Recipe Card and Tags Die, cutting it slightly smaller to fit the sentiment from Sharing your Sorrow. To embellish, I added Vintage Pink Seam Binding , Zva Creative Mini Roses in Pink and Blue, and a Mini Flourish from Cherry Lynn Designs, cut from Olive card stock. The sentiment on the inside of the window is from Our Daily Bread Designs Quote Collection 3. Thanks so much for stopping by, I'm your last stop on the hop, from here you can hop back to the Our Daily Bread Designs Blog! Soooo beautiful, Lisa!! I love how the door opens and you can still see the beautiful stained glass! LOVE this!!!! HUGS!! I love this idea!!! Beautiful, Lis! I'm going to have to try it!! What a gorgeous use of the window, Lisa. The black pops with the coloring of the window!! Love how it opens to the sentiment. Love your card....and how it opens, this is a fab release. Love the two sided effect. Its stunning. What a lovely card. Beautiful colors. Love that window! It's just striking on black and that ribbon really makes it pop! What a stunning card!! thanks for sharing! Beautiful card! I love the Cathedral window. I can't wait to get it! Thanks for sharing! The colors of your beautiful stained glass just pop next to the black window frame...and how creative to make the window open to reveal the scripture! What an awesome release project, Lisa! Hugs! This is beautiful Lisa!!! The colors of the stained glass pop!!! Love this!!! Oh this is pretty Lisa! I love how the black makes the colors of the window really pop! The window opening up is a great idea! Love the sentiments you used as well! What a BEAUTIFUL card to bring encouragement to someone. Thank's for sharing! Beautiful, Lisa! Your colors are so striking and vivid! Love it! absolutely beautiful. Your bright bow really makes the colors in your stain glass window pop!! Gorgeous! Very unique and beautiful cards! Beautiful, Lisa! Your stained glass window is lovely and I love how it opens. The bow and vine are such pretty additions. What a beautiful sympathy card! Love that the window opens! Thanks for sharing! so pretty, the windwo looks great either side you see, neat design! So pretty. I love that it opens and it's so pretty on both sides. This is a really beautiful sympathy card. Thanks for sharing your talent! Really a beautiful sympathy card. Just lovely. Such beautiful coloring. Love the idea of it opening. Beautiful. Love that window and your coloring. I really like the way the card opens and the stain glass is beautiful. Great card and love how it opens displaying the saying. Love it. It is such a beautiful card. Thanks for sharing your creativity. Great card...lovin this cathedral window die!!! Fabulous card love the colors you used! Love the colors you have chosen for the window and the fact that it opens. The sentiments make a great pair! Totally STUNNING. Thanks for sharing. You rock! Such a beautiful card! Thank you for sharing it. Beautiful stained glass look. All the details are perfect! Wow Lisa - your stained glass window looks awesome, what a great technique. And I love your ribbon and flowers - this adds so much to the sympathy card. What a special creation made with so much love. beautiful! love the window opening! Making the cathedral window open for the message was very clever. This is a wonderful card. Beautiful stained glass window card! I love being able to look through the window from both sides. Very smart! Lisa, thanks for sharing this inspiration. I will use this idea for my next sympathy card. It is beautiful!!! Beautiful card...I absolutely love the new stained glass window stamp. I love how your card opens. Such a wonderful surprise. The stained glass is so beautiful too. Love your design! You did a fabulous job of creating the stained glass. Thanks for sharing with us! Lisa, this is beautiful! Love that stained glass window! Fantastic card! I love how the card opens, absolutely gorgeous card. Thank you for sharing. Wow Lisa...what a beauty of a card...just STUNNING...Love the stain - glass window...so beautiful and rich, and what an awesome verse inside!! Wow how Beautiful. love this window die and love the colors. love the added rose and vine. thanks for sharing. Beautiful stained glass window! Love how your card opens and the flourish and flower accents! TFS God bless!! Beautiful card. I love how it opens and you have stamped the sentiment inside. I am loving these cathedral windows. Beautiful sympathy card! Love the way the window opens up to reveal that wonderful sentiment! Thanks for sharing!